You can Ritual Summon this card with any "Nekroz" Ritual Spell. Must be Ritual Summoned, without using any Level 9 monsters. 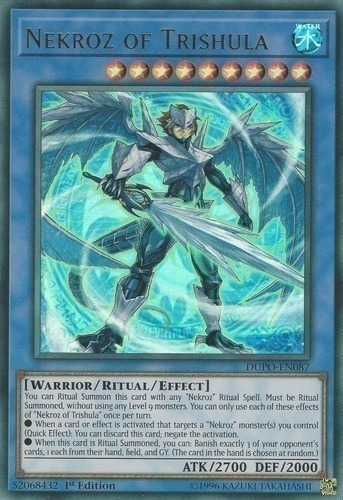 You can only use each of these effects of "Nekroz of Trishula" once per turn. ● When a card or effect is activated that targets a "Nekroz" monster(s) you control (Quick Effect): You can discard this card; negate the activation.